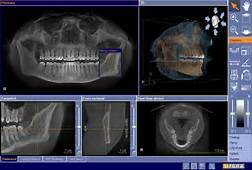 Sirona’s technology extends dental diagnostic X-ray imaging potential for better patient treatment. The visualization tools available in the software assist with a better, more certain diagnosis. This technology allows better coordination of treatment between offices and a way to visually explain findings to patients with greater clarity and accuracy. The GALILEOS 3D Cone Beam system allows for the custom design of implant placement guides specific to the patient. The result is faster, safer, more accurate, and more comfortable implant placement surgery. GALILEOS not only shows 3D displays in perfect image quality, but also enables more complete navigation and diagnosis than the traditional 2D X-ray films.